Business Systems Development and Support, alongside the Stirling Graduate School, have been working together to develop a one-stop web-based system for postgraduate researchers. Research Compass has been developed following feedback from the Postgraduate Research Experience Survey (PRES) in 2013. 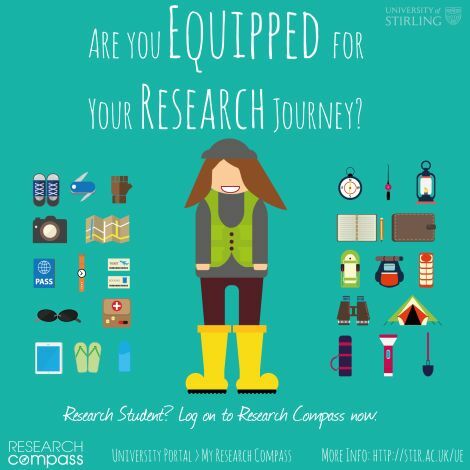 Research Compass seeks to provide a single point of access which enhances the support available for research students at Stirling. Providing a framework of support, formal and informal progress monitoring and an interactive skills development and training system, Research Compass has been developed with the requirements of Stirling’s research postgraduate community in mind. Research Compass was launched in October 2014 and we are committed to offering the best user experience possible. With this in mind, we have been developing the existing functionality and adding new features. We’ve updated Research Compass to give it a modern look and feel with improved usability, ultimately bringing an improved user experience. A new functionality, the dashboard is on the Home tab and aggregates data from various other tabs; showing your key information at a glance. This is available now for students and will follow shortly for supervisors. The Academic Registry will be in touch over the coming weeks to tell students about the new progress reporting mechanism. Some students will see that they have a progress report available to complete. Supervisors should look out for progress reports coming their way for approval. We use student feedback to inform the way Compass is improved. Research students can leave comments or suggestions in the feedback box in the ‘Home’ tab of Compass. Schools can now access key information about their students including progress milestones, progress reports and meetings.